Museums, churches, historical sites and buildings, green open spaces and much more await you in Tbilisi, the capital city of Georgia. Surrounded by mountains and crossed by the Kura River, the city combines the ancient and the modern with a good mix of old streets, dotted with decadent buildings, along with brand new sights and attractions, such as the 360-degree cable car, which takes you up to the Narikala Fortress and lets you enjoy a spectacular view, and the stunning Bridge of Peace, made of steel and glass and beautifully illuminated at night. Dedicated to the Virgin Mary, this charming little church overlooks the city from a steep cliff on the left bank of the river Kura. 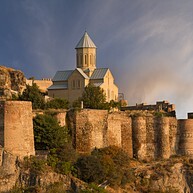 Throughout its history the church was destroyed and rebuilt several times and is now one of the most important landmarks of Tbilisi. Outside the church stands the equestrian statue of King Vakhtang Gorgasali, the city's founder. This ancient fortress sits on top of a hill right next to the National Botanical Garden and enjoys an unrivalled view over the city. For this reason it had been a key strategic point in the city's defence for many centuries, until it was almost destroyed in an earthquake in 1827. Visitors can reach the fortress on foot or with the new cable car from Rike Park. The Bridge of Peace was built in 2010 and connects the old town with Rike Park on the other side of the Kura River. 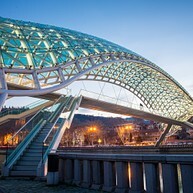 This bow-shaped pedestrian bridge is a marvel of modern architecture, a blend of steel and glass that shines with countless lights during the night. 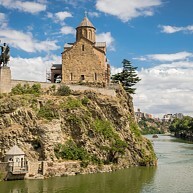 The bridge also offers a majestic view over the Metekhi Church and the Narikala Fortress. 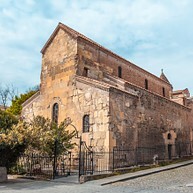 Though some parts of it were renovated (or even added) throughout history, Anchiskhati Basilica still remains the oldest church in Tbilisi, dating back to the sixth century. The church is adorned with icons and holy images and in some spots a few of the original frescoes are still visible. The sulphur baths in Tbilisi are world-famous, in fact the whole city was built on top of thermal springs, with hot water reaching up to 40-50 degrees. There are different baths with different prices, from the cheaper shower rooms to the more expensive private rooms with sauna and massage. Among both locals and tourists Rike Park has become one of the most important meeting points and recreational areas of Tbilisi, a place to relax and stroll around in tranquillity. Rike Park also hosts the main terminal of the cable car that leads to the Narikala Fortress and the two modern tube-shaped buildings that are the new Concert Hall and Exhibition Centre. The Georgian National Museum is the product of the unification of several museums and research centres that hosts various exhibitions, both temporary and permanent, from archaeological treasures to modern art collections and cultural exhibits. Liberty Square is a focal point in Tbilisi and even though it changed names multiple times during its history, it is now a symbol of the Georgian struggle for freedom and independence. 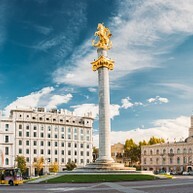 In the centre of the square stands the Freedom Monument, a white column with a golden statue on top depicting St George, the patron saint of Georgia. 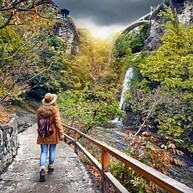 The National Botanical Garden of Georgia in Tbilisi covers an area of 161 hectares in the foothills behind Narikala Fortress and contains a collection of over 4,500 different plant groups. An arched bridge built over a waterfall provides a magnificent view on the Tsavkisistskali river and the garden. 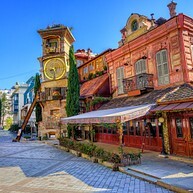 Founded by the famous Georgian artist and writer Revaz “Rezo” Gabriadze, this small puppet theatre has become a staple in the city's cultural life. The theatre offers various plays such as "The Autumn of Our Springtime" and "The Battle of Stalingrad" and even has a little cafe out front. Next to it is the so called Leaning Tower, a curious clock tower that was designed to look like it's about to fall down. Visitors are advised to check for availability as the theatre has a limited capacity.